This high polished draw-knife impresses not only by its appearance and the easier gliding through the wood due to this surface - but also by its short construction. It is versatile and ideally suited for work on small workpieces, especially in sculpture, carving and bow making. The cutting edge is made of high-quality tool steel in the usual "KIRSCHEN" quality and is hardened to 61 HRc. It is delivered to you with a length of approx. 120 mm and a blade thickness of 4 mm as well as a bevel of 25° ready for use. 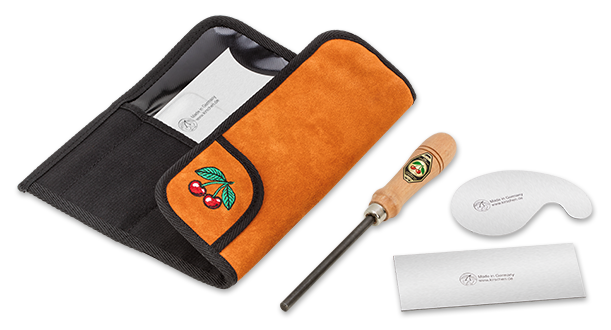 To protect the blade and the surface, the draw-knife is delivered in a protective cover made of velour leather and can thus be stored safely. The elaborate polishing of the surface makes this short draw-knife an eye-catcher and perfect aid for fine work. 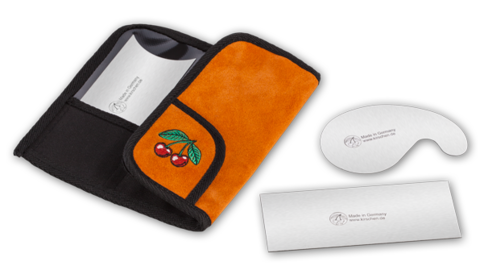 Cabinet scraper blade set with scraper burnisher 4-piece consisting of 1 each Square 150x60x0,8 mm, Hollow and round 0,8 mm, Swan neck, 0,8 mm and round scraper burnisher in Velours-Leather-Wallet. For decades, we have been providing the handles of our chisels with a lacquer coating. Thus, no moisture penetrates into the wood and the handles remains in a faultless condition for a very long time. Thanks to a new technology, we have recently been able to significantly reduce the lacquer application while at the same time protecting the handles just as well as before. For us, it is particularly important that you will be able to see and feel the wood of your chisel handle even more directly in the future. The new finish feels particularly natural and is even better in the hand. Best conditions for working with our chisels. The reactions of woodworking professionals from all over the world have inspired us so far, and we hope that this innovation will soon be a good thing for you. By the way: The reduction of the lacquer application and the new formula also conserve the natural resources and thus the environment. 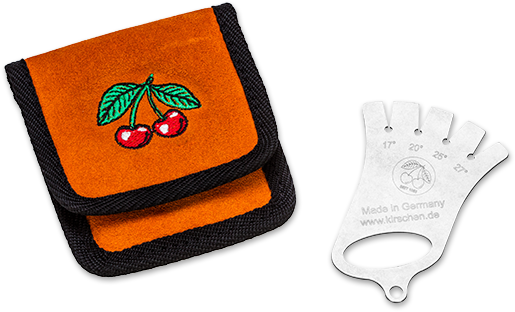 Most tools of our brand »TWO CHERRIES« carry our label marking them as a top product of German quality. Starting January 2015 we use a revised visual appearance for these labels. Whether your product is marked with the new or the old label – the quality of our products remains as high as ever. Only the best for the season! What should I give to my loved ones? This is by far the most frequently heard question for Christmas. 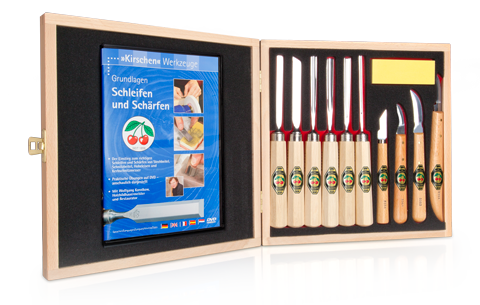 For all carving enthusiasts we recommend this year our eleven-piece carving set including the instructional DVD „grinding and sharpening“. Exquisite tools in a fine packaging are just the thing for winter carving!